Years ago when I was a college student studying in Europe, I tasted Wiener Schnitzel for the first time in Vienna, the city whose name is part of the title of this Austrian favorite. . Fried in butter until crisp and golden, then served with a lemon wedge, these thinly sliced breaded veal cutlets seemed to melt in my mouth. For years I made this dish with veal, but then discovered that chicken works equally well. I added some contemporary touches to this new version by including smoked paprika along with the usual salt and pepper seasonings, replacing traditional bread crumbs with panko (coarse Japanese bread crumbs), and opting for canola oil instead of butter for frying. 2. Spread panko crumbs and flour on separate large plates. Lightly beat egg and milk in a shallow dish. Pat cutlets dry with paper towels. Combine paprika, 1 1/2 teaspoons salt, and 3/4 teaspoon pepper in a small bowl; season each cutlet on both sides with spice mixture. Dredge each cutlet in flour, then dip in egg mixture, then coat with panko crumbs. cutlets to fit comfortably in a single layer until golden brown, 3 to 4 minutes per side. Remove to a baking sheet, and place in oven to keep warm. Repeat with remaining cutlets, adding more oil if necessary. Season with more salt and pepper if needed. Top each chicken cutlet with a lemon wedge and garnish with some salad. Serves 4. Notes: Chicken cutlets can be made by butter-flying boneless chicken breast halves. With a sharp knife held parallel to work surface, halve a breast horizontally starting at the thicker side and not cutting all the way through. You can also ask your butcher to butterfly the breasts for you. Both panko (Japanese breadcrumbs) and smoked paprika are available in many supermarkets. 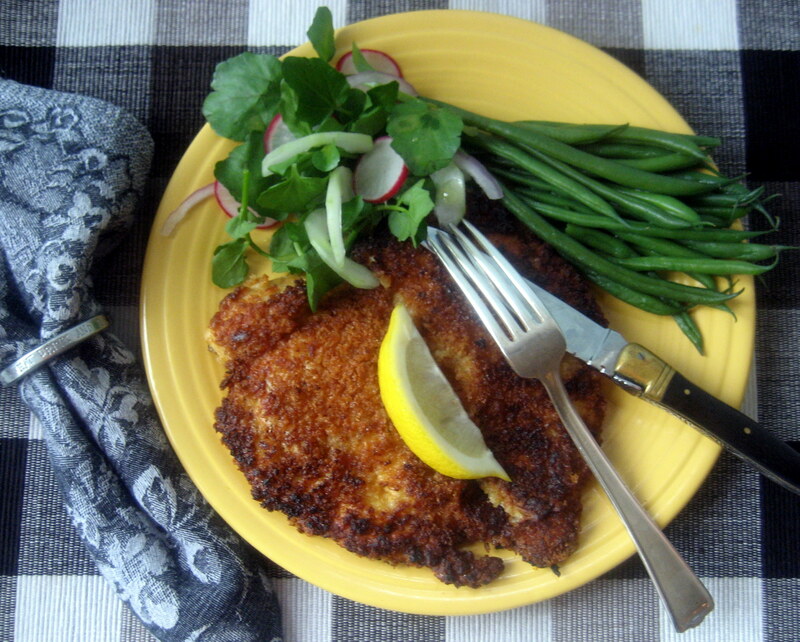 This entry was posted in 2012 Recipes, Main Course, Recipe Pantry, Recipes and tagged cutlets, fried, schnitzel, veal, Vienna by brosbottom. Bookmark the permalink.